A vast majority of reviewers gave high marks to the comfortable, sock-like fit of the Nike Free Train Virtue. Many training enthusiasts found the shoe to be perfect for exercising in the gym. The lightweight construction of the trainer received praise from a number of testers. The sock-like part of the upper supported the ankle very well, noted a consumer. Several purchasers considered the product to be well worth the money invested. A user complained that a hole opened at the back of the shoe after less than two months of regular gym training. Another reviewer thought that the stretch collar of the shoe could be improved as it didn’t offer any ankle support. A disgruntled reviewer mentioned that he had a problem slipping the foot into the shoe. The Nike Free Train Virtue proved to be a very comfortable and well-performing training shoe for many athletes. There were still several individual complaints about the discomfort caused by the collar of the trainer. However, very few durability issues were reported. Overall, the reviewers found the shoe to be an investment well worth making. - The Free Train Virtue is a men’s training shoe designed for cardio, agility, and gym workouts. - Under the foot, the Nike Free technology works together with the Tri-Star flex grooves to allow natural movement and flexibility in all directions. At the same time, the rubber nodes add traction for a more stable landing. - The dual-density midsole provides comfortable cushioning for a smooth transition of the foot. - The upper features the dynamic stretch bands. Coupled with the Flywire cables, they offer a secure, yet lightweight coverage. - The stretch collar creates a supportive, seamless fit and an easy entry. The Nike Free Train Virtue is only available in the men’s version. It typically runs true to size. Fitness enthusiasts are able to get their regular size when they choose this shoe. The available width is D – Medium. The grooved Tri-Star outsole features triangular patterns, which allow the platform to move in accordance with the natural motion of the foot and give an explosive speed from the first acceleration. Rubber units are placed in the heel and forefoot sections for enhanced traction and durability. The combination of these technologies provides both great responsiveness and solid support for the foot during speed movement and quick changes of direction. The lightweight dual-density midsole combines hard and soft foam to offer a plush, yet dynamic cushioning. It ensures smooth transitions of the foot during runs and reinforces the shoe’s shock-absorbing properties. 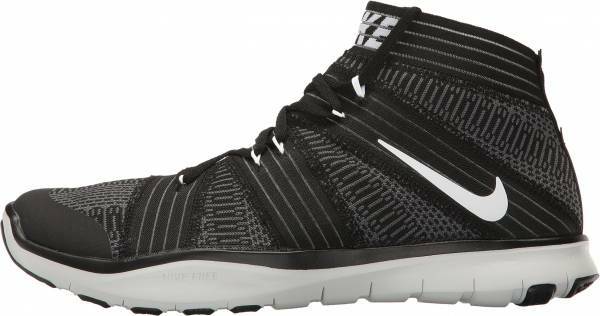 If you are doing CrossFit and would like to keep the flexibility and natural feel of the Nike Free sole but need more stability for weightlifting, be sure to take a look at the Nike Free x Metcon as well. The spacious forefoot section accommodates natural toe splay, which is helpful when it comes to acquiring steadiness during weightlifting. The engineered knit upper of the Nike Free Train Virtue is flexible and breathable. The main textile material is integrated with the dynamic stretch bands to heighten the snug coverage while still encouraging the natural movement of the foot. Support is maximized by the Flywire nylon threads, which are attached to the lacing system to hold the foot firmly in place. The bootie-style construction of the upper utilizes a stretchable collar, which offers a supportive and glove-like fit. A pull-tab is placed in the heel section. It makes it easier for the wearer to wear and remove the shoe. The seamless textile interior design offers additional comfort to the foot of the wearer. It smoothness of the material prevents irritation.